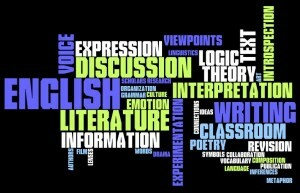 I visited Wordle.net to help me out with today’s post, which is about the English classroom. The word images above and below show the many interrelated concepts/activities that I teach and expect in my classroom. Last week, I devoted an entire class period to discussion on thematic, characterization, and inference-based questions on the novel The Outsiders which my students just read. They were confused! I was not handing them a worksheet. I was not looking for correctness. I was not telling them to be quiet. All I was asking for was a respectful, engaged discussion. I even put the desks in a circle (in this classroom, that’s radical). 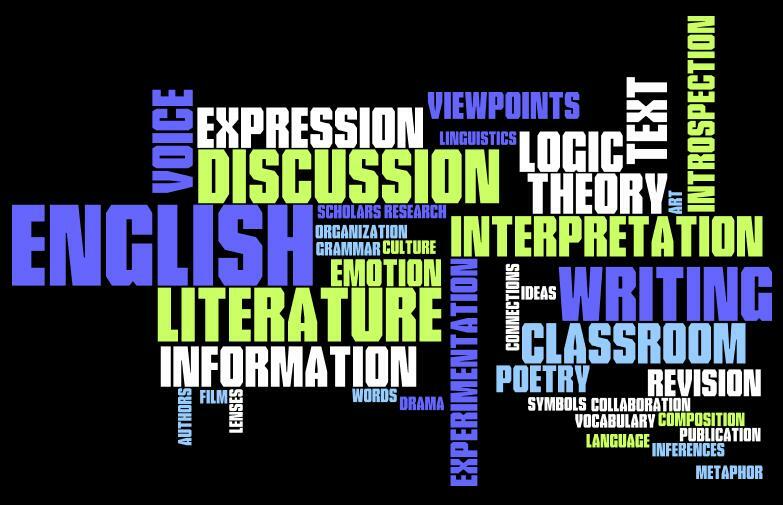 I stressed that discussion skills are important to learn, and that talking about our reactions or ideas about books is a big part of what English is all about. I was so proud of them–they really got into it, and I got so much participation, even from students who barely ever speak up. I was shocked that this was such a new type of activity to my eighth graders. They are still being weaned from their steady diet of sit-quietly-and-fill-this-out worksheets. 1. 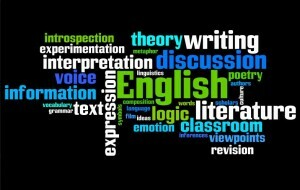 Learning the language itself, its rules (what they are, what they’re for, when to follow them, and when to not), its effect (how to organize sentences and paragraphs to create different reactions), its words (an extensive vocabulary with words for any purpose or occasion), and its history (anything from etymology to linguistics to connotations). 2. Learning to compose in such a way that one can speak from the heart through the flawless execution of Standard American Spoken English as well as honestly from one’s home dialect. Wielding writing for creative, expository, persuasive, and reflective ends. Achieving clarity and a true voice through the written word. 3. Learning to speak about literature and culture. Having discussions and debates with peers reflecting the lively exchange of ideas that come up through reading, whether these ideas harmonize or conflict. Respecting the opinions of others while firmly supporting one’s own. Contributing to and collaborating with a community of scholars. 5. Deciphering, understanding, and interpreting the beautiful mysteries that authors create with our language, through metaphor, symbol, allegory, ideological lens, and theme. Letting others speak to us and through us, and speaking back. 6. Conducting research to answer a question worth asking. Learning to locate and utilize sources such as books, articles, online sources, films, images, personal interviews, letters, and observations to help answer this question. 6. Seeing literature, art, film, culture, and ourselves as texts. P.S. For a better, more official list than mine, view the standards set forth by the National Council of Teachers of English or the state.